BEACON FALLS — The Woodland boys swimming and diving team split a pair of meets before Christmas to open up the season with a 1-1 record. In the Hawks’ Naugatuck Valley League opener against Oxford, Woodland came away with a runaway 94-76 victory. Woodland’s individual winners included Greg Aldrich in the 200 individual medley (2:23.91), Jeff Varesio in the 50 freestyle (25.78), Jake Stow in the 100 backstroke (1:08.53) and Riley Clark in diving (220 points). 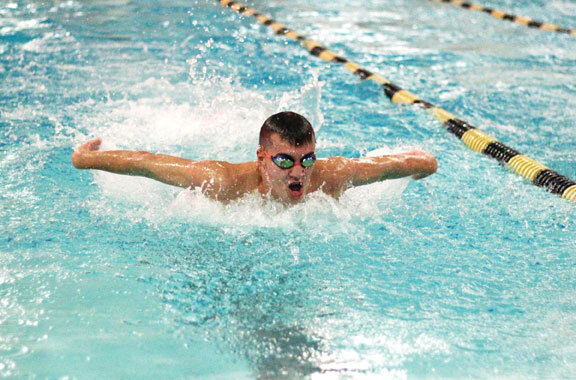 The Hawks also earned a pair of relay victories. The 200 medley relay squad of Aldrich, Stow, Varesio and Chase Chura claimed a meet-opening win in 2:01.15, and the 200 free relay group of Clark, Ryan Curtain, Joe Flaherty and Zach Arisian touched first in 1:51.23. Woodland tested itself with a nonleague meet against Berkshire League powerhouse Northwestern on Dec. 21 but came out on the wrong end of an 89-81 decision. Stow earned another win in the 100 backstroke (1:07.95), Aldrich claimed the 100 breaststroke (1:12.10) and Clark took the diving event (192.70 points), but the Highlanders won five individual events and the first two relays. Woodland closed that meet by taking the 400 free relay, as the team including Varesio, Arisian and Zacary Bertrand touched first in 4:02.95. Hawks coach Tom Currier did not respond to a request for comment. Woodland will enjoy the rest of a two-week holiday break from dual-meet action before hopping back into the pool next Friday for a 4 p.m. home meet against Torrington.